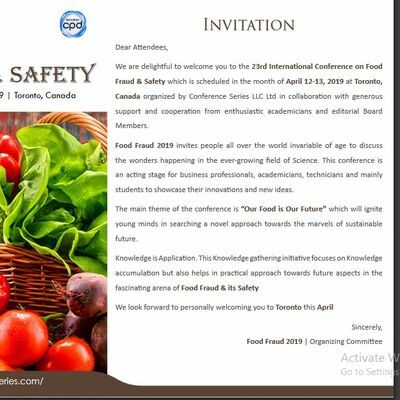 Food Fraud 2019Food Fraud 2019 invites all the participants from all over the world to attend “23rd International Conference on Food Fraud & Safety” during April 12-13, 2018 at Toronto, Canada. Food Fraud will focus on the theme “Our Food is Our Future”Conference Series LLC Ltd is an open resource platform that conducts 3000+ global events including International Conferences, Workshops, Symposia, Trade Shows, Exhibitions and Science Congresses in all the major scientific disciplines, including Clinical, Medical, pharmaceutical, Engineering, Technology, Business Management and Life Sciences across America, Europe, The Middle East, and Asia Pacific. It is reaching over 25 million researchers, scholars, students, professionals and corporate entities all over the globe.Why to Attend?? ?Educational opportunities: No matter how experienced you are at your business, everyone can learn. Working in research projects or business venture one can often be isolating, and without exposure to a variety of points of view, we can miss new ideas and trends that can impact future results. The educational aspect this conference can expose you to new ways of conducting your business and help you discover how to be more productive.Networking with peers: Food Fraud 2019 conference will provide a great opportunity to network. Often competitors from other regions of the country can become valuable resources for referrals and best-practices. Avoiding peers for fear of others discovering your competitive advantage can actually limit your own success. Collaboration is the way to approach networking. While there are those whose intentions can be suspect, most people can help each other uncover ideas and spark inspiration when they get to know each other on a personal level.Expand your Business: Food Fraud 2019 is a place where you can learn more about the current business climate. Discovering innovative products and services for your business is necessary to stay competitive in today’s fast-paced world. Plus, these vendors who sell to your industry fully grasp what is happening inside your competition. 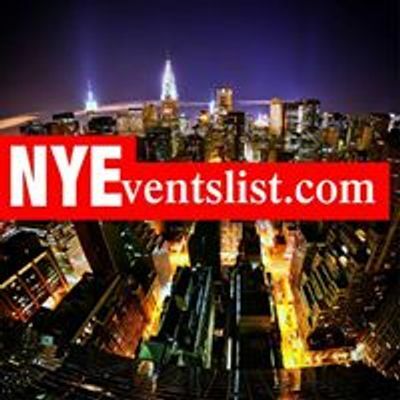 Invest time with the sponsors at the event and turn them into your friends and allies.Position yourself as an expert. When you are active in your research and industry, you can develop a reputation as an expert to your peers and your clients. Those who are engaged over the long term are often asked to speak at the events and to write articles for their publications. Like it or not, others like to associate with the experts in any field. Clients feel good about doing business with those that are celebrated by their peers. If your strategy is to be the best-kept secret in your business community and research area, you will be missing a valuable opportunity.Have fun. Being in research or business should be rewarding and fun. All work and no play can get old fast. Food Fraud 2019 conference can add a layer of enjoyment to managing your career growth by mixing a social aspect into your learning and industry branding efforts. Who Should Attend and Who You’ll Meet?Food Fraud 2018 would meet with Food Manufacturers, Food and Beverage Wholesalers & Retailers,Food Processors, Suppliers, Government Organisations and State Agencies, Deans, Directors, Professors, Students, Research scholars and other participants including CEO, Consultant, Head of Management, Economist, and Project Manager from business and industrial sectors across the world in order to establish a scientific relation between academic experts and other participants through information sharing and networking. The Conference will also have a space for companies and/or institutions to present their services, products, innovations and research results.Importance & Scope?The field of Food Fraud have not only helped the development in different fields in science and technology but also contributed towards the improvement of the quality of human life to a great extent. All this has become possible with the different discoveries and inventions leading to the development of various applications. The core aim of Food Fraud 2019 conference is to provide an opportunity for the delegates to meet, interact and exchange new ideas in the various areas of Food Safety. 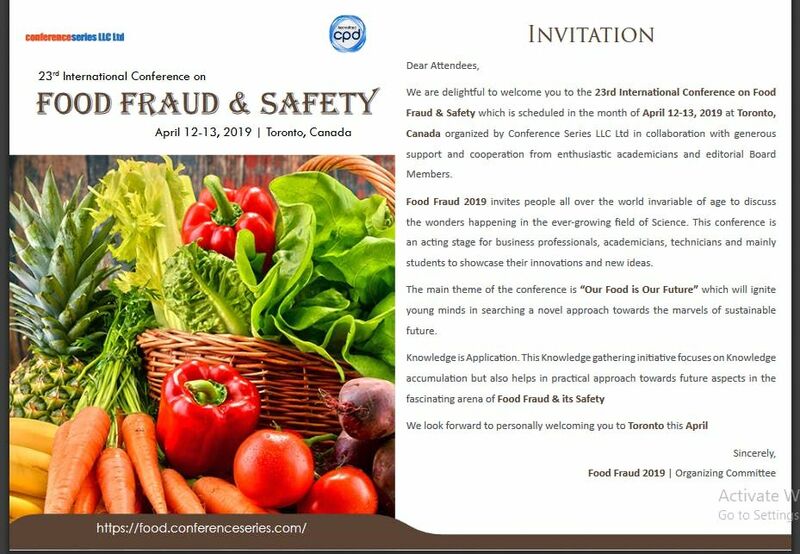 This International Food Fraud conference will feature world renowned keynote speakers, plenary speeches, young research forum, poster presentations, technical workshops and career guidance sessions.Target AudienceFood Fraud 2019 aims to bring together leading Academic scientists, NGO professionals, Food Agronomists, Food Policy makers and regulators, Researchers and Research scholars to exchange and share their experiences and research results; about all aspects of Food Safety & Public Health and Economic regulations. It also provides the premier interdisciplinary and multidisciplinary forum for researchers, practitioners and educators to present and discuss the most recent innovations, trends, and concerns, practical challenges encountered and the solutions adopted in the field of Food Fraud & Safety, with respect to Public Health and Global Economics.Why Toronto, Canada?Toronto is Canada's largest city, the fourth largest in North America, and home to a diverse population of about 2.8 million people. It's a global centre for business, finance, arts and culture and is consistently ranked one of the world's most livable cities. Toronto has a vibrant history of change and growth, ranging from its early occupation over 1,000 years ago to its current status as North America’s fourth largest city. Toronto is Canada's largest municipality and is made up of the former cities of Toronto, North York, Scarborough, York and Etobicoke, and the former borough of East York. The city is home to a large immigrant population, and is a national and international hub for finance, communications and cultural life. Diverse cultures, climates and landscape make Canada a destination to suit any interest. Canada is a country of immigrants and has a policy of encouraging diversity. Thus, urban hubs feature a range of ethnic neighbourhoods, restaurants, and shops. In addition to rich and varied urban centres, Canada’s natural environment is one of the most beautiful in the world. From pristine coastlines to rugged mountains and sparkling lakes, Canada’s geography inspires awe coast to coast.The western side of Toronto is sometimes only thought of as place where industry and residences bump up against each other, but it is also a place where there are wonderful parks and waterways and where numerous pockets of small businesses and local spirit create active and diverse communities. Combining suburban enclaves and malls with condominium developments and the dense business district surrounding the North York Civic Centre, the north-central tip of Toronto is at once both relaxed and exciting. The area is also home to York University and Black Creek Pioneer VillageThe Conference aims to: Discuss current knowledge, domestic and international experience related to early identification, prevention and management of food fraud incidents Identify Gaps and discuss opportunities of collaboration to support action addressing food authenticity assurance and prevention of food fraud globally Create momentum to mobilize resources and lead to early deliverables by partners and stakeholders in areas related to research, detection, risk management and food regulatory policy development dealing with food fraud Sessions/ TracksFood fraudFood fraud is the act of purposely altering, misrepresenting, mislabeling, substituting or tampering with any food product at any point along the farm–to–table food supply–chain. Fraud can occur in the raw material, in an ingredient, in the final product or in the food’s packagingBiosensors and Food SafetyBiosensor is an analytical device that converts the biological reaction into electrical signals with the help of a transducer and generates real time Data. It is used detect analyte that interacts with the biological element associated with the transducer that gives out a measurable signal proportional to target analyte. The biological membranes can vary form microbes, cell organelles to nucleic acid. Transducer can be optical, electrochemical depending on the type of interaction with analyte.Food safety requires fast effective real time methods to take the edge of adulteration, neurotoxins, pathogens, harmful chemicals, heavy metals etc. that affects humans, plants and animals. Biosensors in food safety can be a cost effective and time saving approach towards maintaining the international stands in food industriesFood safety Laws & RegulationsFood Safety Regulations. Modern day food safety regulations were developed on sound scientific principles to protect consumers from incidents of foodborne illness and death. With globalization, the supply chain must be carefully monitored to ensure imports meet food safety regulations and are free from tampering.Food Safety Certifications Facilities which prepare, handle or serve open hypothetically hazardous food should have an owner or employee who has been successfully completed an approved and accredited with food safety certification examination. Foodservice business which serves "high risk" populations will be the first part of the industry required to fulfill with the new guidelines. At least one individual from each foodservice establishment should be certified in food safety techniques. The original certificate is required to be maintained on site at the facility. It is the duty of the certified food supervisor to ensure that all employees have sufficient knowledge and are well trained in food safety as it recounts to their assigned duties which are framed by FDA (Food and drug administration)PCR and Food IndustryThe Polymerase Chain Reaction (PCR) technique was invented by kary B. Mullis in 1985, which helped scientist in making millions of copies of DNA, Which later had a wide spread usage in the many disciplines of life sciences from diagnostics of genetic disorders to identification of HIV in Human cells. There is increase in demand for a real time technique in Food Industry for quality assurance of food, which can bypass microbial method as they consume more time. In this case PCR is playing a key role in detection of pathogens in food and minimizing the affect food borne illness. PCR based methods in Food Microbiology led to the development of faster, much sensitive and more specific protocols.Food Safety & Quality Management Strategies and TechnologiesQuality management implementation it is a management technique to assure, to control and to monitor the product quality in order to ensure that the end product was manufactured with high quality the development of food safety is mandatory while quality assurance is voluntary. It is not the same to implement food safety such as: GMP, SSOP, HACCP and/or others, that assures the consumption of food is safe, than to implement quality assuranceSupply Chain Vulnerability Risk AssessmentsPotential supply chain risks are identified by a systematic investigation of all factors (sources) that might lead to risks The consequence of each identified risk and its corresponding likelihood are determined by analysis the risks are prioritized based on their consequence and likelihood For those risks that need to be addressed with action, mitigation strategies are developed in accordance to the objective of the supply chainFood Fraud mitigationThe plan must be designed to address the risk factors identified in the food fraud vulnerability assessment. It will be different for every company depending on the types of risks identified, as well as the nature of the companies’ ingredients, products, and geographic presence. PwC can help you design and implement a food fraud risk mitigation plan, employing our extensive experience in risk assessment, internal controls and supplier management. Food fraud mitigation plan will address areas such as governance processes, company ethics, workplace culture, sourcing and supplier management, and controls over processing and distributing food to consumers.Horizon scanning and testingHorizon Scan monitors commodity safety and integrity issues worldwide, collecting data daily from more than 100 food safety agencies and other reliable sources, delivering timely alerts on emerging food safety issues. It can help you to meet all consumer and regulatory demands for transparency and accountability across the ingredient supply chain, by identifying potential food safety threats before they become a problem.Safety of the food supply- From Farm to MarketThe consumption of fresh cut produce continues to increase globally. Technological advancements have in turn aided in increased global production of fresh produce to meet the increasing demand. However, there is serious concern as to whether this increase in supply and demand is leading to safety issues, as showcased by the alarming number of outbreaks associated with fresh vegetables and fruits, in the US as well as globally. And also it is important for people to understand the activities contribute in the food industry for the safety of food and how they can decrease the risk of foodborne illness. From processes on the farm to practices in the kitchen Food Safety Regulations & International Food TradeInternational Food Trade signs that food has gone international. More and more food is moving across borders for a combination of social, economic and technological reasons. Transportation has improved greatly, and better ways, such as freezing, have been found to preserve foods. Many developing nations were ready to sell the foods they were producing to obtain funds to continue building up their countriesBlockchain in Food IndustryBlockchain technology is a way of storing and sharing information across a network of users in an open virtual space. Blockchain technology allows for users to look at all transactions simultaneously and in real-time.Blockchain makes a supply chain more transparent at an all-new level. It also empowers the entire chain to be more responsive to any food safety disasters.Blockchain also allows specific products to be traced at any given time, which would help to reduce food waste. For instance, contaminated products can be traced easily and quickly, while safe foods would remain on the shelves and not be sent to landfills.Food Fraud: Detection, Prevention & ManagementThe process to ensure the security of food and drink from all forms of intentional malicious attack including ideologically motivated attack leading to contamination. Food Fraud is an important and evolving food industry focus. Even though the vast majority of these incidents do not have a health hazard in some ways they are more dangerous because the substances and actions are unknown and untraceable Food Fraud is the collective term encompassing the intentional substitution, addition, tampering or misrepresentation of food/feed, food/feed ingredients or food/feed packaging, labelling, product information or false or misleading statements made about a product for economic gain that could impact consumer healthPublic health risks associated with food fraudFood fraud, including the more defined subcategory of economically motivated adulteration, is a food risk that is gaining recognition and concern. Regardless of the cause of the food risk, adulteration of food is both an industry and a government responsibility. Food safety, food fraud, and food defense incidents can create adulteration of food with public health threats. Food fraud is an intentional act for economic gain, whereas a food safety incident is an unintentional act with unintentional harm, and a food defense incident is an intentional act with intentional harm.